Architectural plans for what they are calling the `replacement’ for the Donnell Library are out and they are likely to shock you. 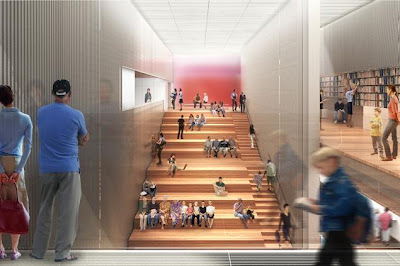 See: A Place to Hang Out (Read, Too), by Robin Pogrebin, May 6, 2013 and New York Public Library unveils designs for new $20M branch on W. 53rd Street, by Ginger Adam Otis, May 7, 2013. The plans, giving short shrift to the public, are a pathetic joke: Less than one-third the size of the original Donnell, the plans depict what is basically a bleacher-like staircase descending underground oriented to a street level window to disguise the fact that the bulk of everything is subterranean. Gone is the new beautifully large auditorium, the new state of the art media center, the new teen center. The collections of the old Donnell are disbursed and disrupted. The NYPL sold most of its rights and space in a building on 53rd Street in Manhattan across from MOMA between 5th and 6th Avenues for an undeniable pittance. Just how little the NYPL got was confirmed with exact figures at the time these plans were unveiled. The NYPL sold a mid-Manhattan building that was five stories above ground with a new huge auditorium below ground netting only $39 million. The NYPL promises that the `replacement’ Donnell will be constructed without incurring cost overruns but if there are cost overruns then that net amount will become an even smaller figure. 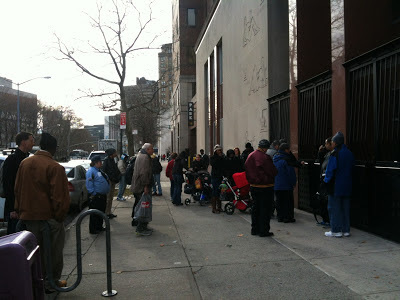 Another cost to the public: As a result of the sale for shrinkage of Donnell the public is enduring a shutdown of all the library services from 2008, a shutdown that will continue to at least 2015. The NYPL gave all that was the old Donnell up for just $39 million while just the penthouse in the building now going up at that site is selling for over $60 million. Would anyone care to guess how many multiples of these figures it would cost to replicate the old Donnell? The confirmation of how little the NYPL was getting came this month from NYPL Chief Operating Officer David Offensend who presided over the structuring of the sell-off of Donnell in 2007. Noticing New York previously noted The Real Deal report to the real estate industry that the sale of the Donnell property to Tribeca Associates and Starwood Capital had closed for $67.4 million. That may be an accurate figure for what the buyers paid to get the property transferred over to them from Orient-Express Hotels, the company that originally signed the contract to with the NYPL in 2007 to purchase Donnell, but Offensend confirmed that the NYPL’s gross was only $59 million. 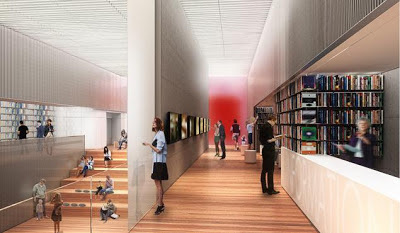 Offensend also confirmed that the one-third size basement replacement library was costing the NYPL $20 million to build, thus resulting in the netting of only $39 million. According to what Mr. Offensend told the New York Times in March of 2011 the final deal involving the transfer of the original contract needed the NYPL’s approval to go forward. The NYPL could therefore have reconsidered and opted out of the transaction* or at least demanded a better recompense as late as 2011. But it didn’t. 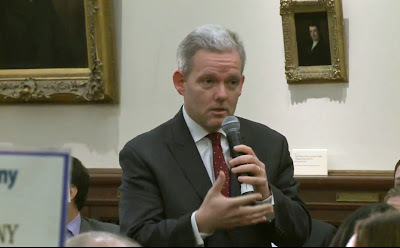 The week the Donnell 'replacement' plans were unveiled I was at two presentations of them, the Monday, May 6th presentation to the Education, Housing and Human Services Committee of Manhattan's Community Board 5 and the Wednesday, May 8th presentation to the trustees of the NYPL. 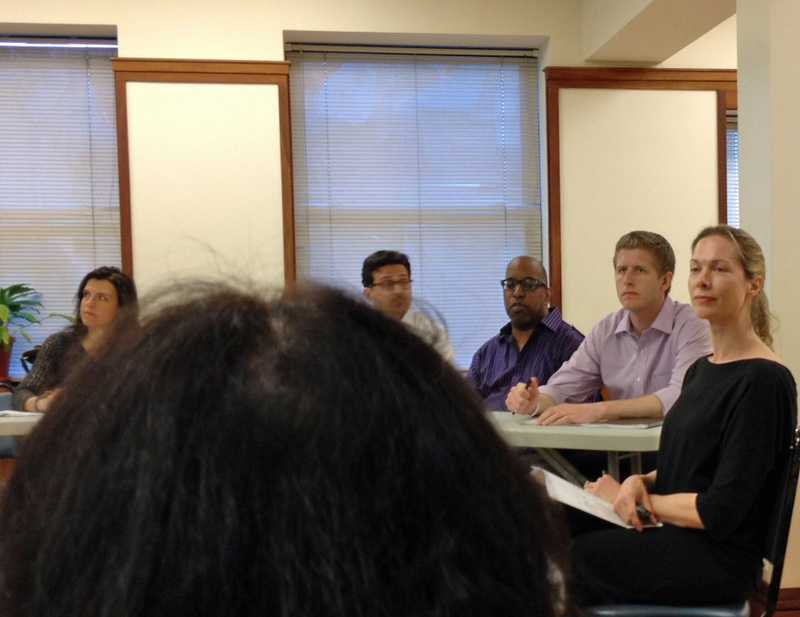 At the Community Board 5 meeting Mr. Offensend said that the sale of Donnell had `wound up' as a competitive process (although almost everybody remembers finding out about the sale only after a buyer had been selected.) Offering an interesting description of those past events, Mr. Offensend explained that the Orient-Express hotel company had an inside track on bidding and that nobody else wanted to bid higher because that company already had a kitchen available that they could use in conjunction with building a hotel there: They owned the 21 Club restaurant on an adjacent 52nd Street lot, giving them “an almost unique interest” in the property. An important component of the sale resulting in the 50-story building that is now being erected was that, as described by Mr. Offensend with little elaboration, the owner of 666 Fifth Avenue* agreed to eliminate a height restriction affecting the property. Originally it had been reported that Orient-Express would build a hotel of eleven stories. One must wonder why and if that would have provided reasonably sufficient justification to speed into a deal to buy and tear down the five-story library. If you ask people you know in the real estate business they are almost certainly going to confirm for you that between the “almost unique interest” flowing from having the kitchen next door to the Donnell site and the ability to build a tower on the site with many extra stories, the latter is the far more important advantage one would want to lock up. Presenting the Donnell plans to the NYPL trustees, President Anthony (“Tony”) Marx described the $39 million net figure for selling Donnell as “something in the area of $40 million”. . . Because a precisely stated $39 million figure would have sounded just too darn small? The public in attendance at the Community Board 5 was 100% negative about the new designs. Most of the comments were about how small and un-library like the designs were. I was permitted to state a combined comment and question. I noted that there is something that is both marvelous and sad: It is said that if a man suffers an extreme loss, say losing his legs or becoming a paraplegic, that the loss will be followed by unhappiness and grief but that even after such extreme losses human beings tend to return to a certain baseline or “set point” of happiness. Still, apart from the marvelousness of such human resilience I said I thought the saddest aspect of this was people would unfairly take things from others, expecting by taking advantage of this fact, expected that when a library like Donnell is wrenched away the public should be happy afterwards. I then asked why, if the theoretical purpose in selling Donnell was to capitalize on the potential value of the greater development that could be tapped (was that really the purpose? ), the NYPL hadn’t built a bigger library, a better library, to serve a growing city rather than a much smaller, makeshift subterranean one? After all, the city is a larger, wealthier city! An image of a more appropriate film being shown in the space? : Ronald Reagan awakens, his legs missing, screaming, "Where's the rest of me?" The question of why not a bigger, better library was not directly answered that evening except to the extent that Mr. Offensend said, in the course of some later general statements, that he viewed the new replacement space as equivalent space and that he thought that the reshuffling of programs and services off to other libraries in the system was a better way to serve the community. 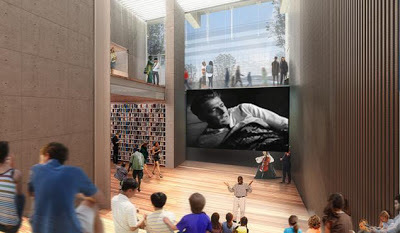 One reason the plans for the new Donnell don’t look like a library is their disregard for books. At the Community Board 5 meeting the presenting architect was asked whether the NYPL had specified what it wanted in terms of the books that it wanted accommodated in the space being designed. The answer was that nothing had been specified either in terms of a book count or a required square foot area for books. In terms of the images . . again, this is schematic. . So when you see images like this, this is not to say that books are higher than the allowed seven rows. This is just simply to say that books are important to us, the books are important to the library when they came to us. . . that accessibility and visibility of the books is critical and that it should be something that helps define the space and create the character of the space. The little space for actual books caused New York Magazine’s architectural critic Justin Davidson to wonder about the NYPL in a tweet: “Wonder if it'll make space for Orwell?” How about Bradbury? Plans to get people out of the library in "two minutes"
The plans show some books by the front entrance. The NYPL trustees were told that the design was so that somebody ordering a book ahead of time could dash in to get it, needing to spend no more than “two minutes” in the library to get it. The stairway as library space is clever in that it is not only being used, oriented toward the one big street level window, to hide the fact that the space is subterranean; it also, by obviating the need for a stairwell, obfuscates the shortage of space in available and might otherwise have to be subtracted out for that purpose. In the presentation, the stairway type space was praised for its “flexibility.” As I have written in Noticing New York before, the praiseworthiness of “flexibility” (or “Murphy libraries”) is something that library officials are now onto as a way to extol the attractiveness of smaller libraries. 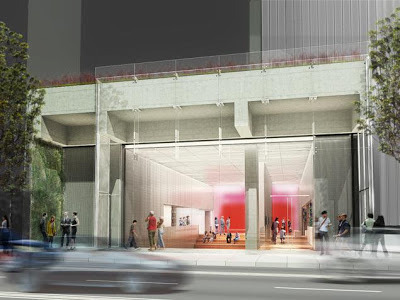 Sale of the Donnell Library site was no doubt inspired by the MOMA Museum tower rising to great heights right across the street: Will this be the view toward which the gaze of library bleacher sitters will be directed as they gaze through the window above? Library officials describing what the stair space can be (an auditorium, a daylight-admitting movie theater, a reading space, a concert space, a meeting or discussion space, even stairs!) display improvisational imaginations resembling Jonathan Winters on Jack Paar’s Tonight Show when handed a stick (it’s a fishing rod, a circus ringmaster’s whip, a flute). Tony Marx referred to the bleacher/stairs as both an “agora” and a “piazza.” What is perhaps not so flexible is that when used as seating those steps will not be able to be moved or adjusted. 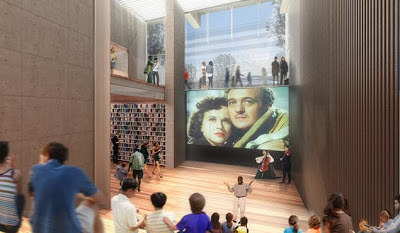 I haven’t visited the site to try to figure it out yet but will all those sitting on these steps legs forward find that their gaze, directed up through the street-level window, will be trained on the vertiginous sheerness of the Museum Tower’s monotonous glass walls? The trustees were informed by the architect that the multiple uses would present complex problems when it came to noise that could not presently `pretend to have all the answers to.' At the Community Board 5 meeting assurance was given that buffering would prevent subway noise from being a problem despite the library being underground would be closer to it. The architects said they are looking at how to add “soft surfaces” to the "first cut" of the plan to reduce the sound levels. The steps design of the library presented to the NYPL by name architects (Enrique Norten and his firm TEN Arquitectos) is actually something of a fashion knock-off, looking a great deal not like another library but like Rem Koolhaas’s 2001 design for Prada's flagship in SoHo. At 24,500 square feet the Prada store is almost a match for the library’s 28,000 square feet. 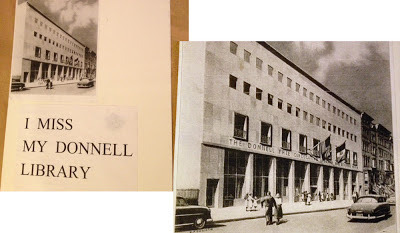 (The old Donnell was 97,000 square feet.) At $40 million the leased (fifteen years) Prada store in 2001 is double the $20 million being spent to build the library in 2013 and more than the NYPL sold the old Donnell for at the height of the 2007 real estate bubble. . . . 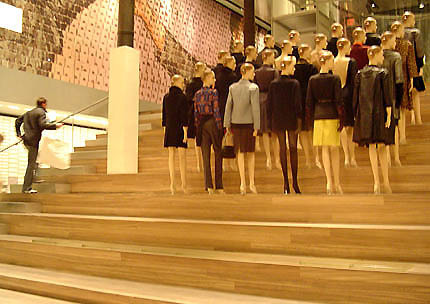 Upon entering the store, which previously housed the SoHo branch of the Guggenheim Museum, visitors are met with a largely vacant space dominated by an oversized, round elevator. OMA is said to have spent two months of research "investigating ways to reinvent the retail experience." Perhaps as a result of this, the ground floor only has a small amount of merchandise, relegating the majority of merchandise and actual shopping activity to the basement level, which feels cramped and lacks appropriate lighting. If the new “Donnell” design doesn’t work out as a library, as it well might not, might it be transformed into another Prada store or the equivalent? 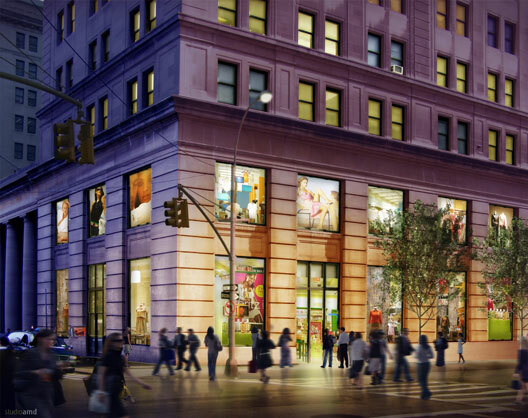 That’s a distinct possibility: As noted above, the space Prada took over for its retail enterprise was previously Guggenheim Museum SoHo branch space. 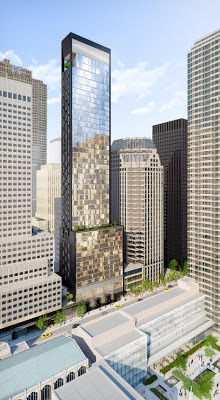 And would that not be a consummation devoutly to be wished by Tribeca Associates and Starwood Capital as the owners of luxury Baccarat Hotel tower, in which this space will be in the basement level? They seem to have been pretty lucky in having wishes fulfilled at the expense of the public to date. When the Donnell sale was announced, Francine Fialkoff, Editor-in-Chief of Library Journal, wrote an editorial (February 1, 2008) excoriating the lack of transparency in that transaction: Donnell sale highlights need for transparency in decision-making. Here are some extracts from it.
. . . the building that housed Donnell has been sold to make way for a hotel and a much smaller public library. . (w)ith the proposed library having less than half the space for public services as the old Donnell . . . questions remain about the location of some of the collections. . . More importantly, the breakup of the collections diminishes the role of Donnell as a central library . . . The decisions . 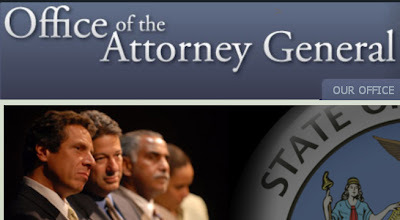 . . [were] communicated to staff (and in the case of Donnell, to the public) largely after the big decisions have been made.
. . . It's way past time for NYPL leaders to come out from behind their cloak of secrecy. . get staff and public feedback before making any other sweeping changes. Original Donnell auditorium being used for Jane Jacobs event in 2007, just before its announced destruction. Not long after its expensive renovation. I really just want to thank Joanna and Dave [Offensend], in particular, for their leadership in this project from its beginning. Of course none of us could foresee that the economy would change and change the schedule of this. . .
That’s not an excuse for how little Donnell was sold for since its sale price was set at the height of the real estate bubble preceding that crisis; it is only an apology for the fact that replacing Donnell (maybe in 2015) after its 2008 closing is taking so long. Addressing the trustees to tell them such prognostication was impossible Marx displayed a sort of chipper pride. What’s really scariest about this lack of apology from Marx and Offensend is that it goes along with envisioning these Donnell plans as the desirable model for all the city’s libraries. On a scale of 1 to 10 with 1 being that this is a complete disaster that the NYPL is doing their best to cope with and 10 being that this is something exemplary that the NYPL wants to roll out to replace libraries throughout the system, how would you rate this? He told me how great it was going to be for the users. I told him he was saying all the right things. Offensend told me that he thought I was trying to make a sow's ear out of a silk purse. The new shrunken Donnell plans are Offensend's silk purse?. . . This is the model for the future?
. . . What does this portend for the future of libraries in the city? What does it say about the pride that Tony Marx and David Offensend are taking in the consolidating shrinkage of the Central Library Plan? That plan also involves a suspiciously hurried and unexamined shedding of NYPL real estate assets to questionable ends. Under that plan the research stacks of the Central Reference Library at 42 Street and Fifth Avenue under the Rose Reading Room would be demolished (the books being sent to Princeton, New Jersey), decommissioning that library as the important reference library it was intended to be. The stacks are being ripped out so that the Mid-Manhattan library (the city’s most used library) and SIBL, the relatively new Science, Industry and Business library integrated with CUNY in the converted Altman’s Department Store building at 34th Street can be sold and jammed into that former stack space with cast-off remnants of the old Donnell. What does this portend for the cities other libraries such as the Brooklyn Heights Library at Cadman Plaza on the border of Brooklyn Heights and Downtown Brooklyn? Even though that Brooklyn library is part of what is technically a separate system* (although all mostly funded by the city), its proposed sale for shrinkage closely replicates that of Donnell even as Brooklyn Public Library officials say they disavow the Donnell model. At the same protest event Offensend speaks with Citizens Defending Libraries Carolyn McIntyre (my wife) whose petition calling for a halt to the sale of libraries for real estate deals now has over 11,000 signatures, most of them online. 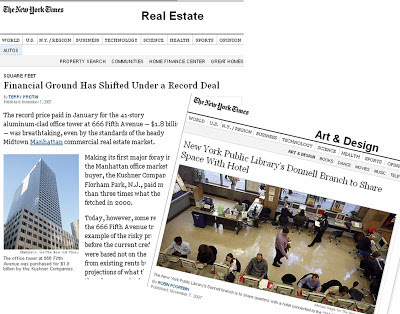 This article is about the the selling off of New York City libraries, the shrinkage of the library system and the deliberate underfunding of the libraries as an excuse so justify the sales that create real estate deals that benefit developers, not the public. It is also about another big topic that must be written about carefully: Consideration of how all of the above is infused with issues of race, equality, opportunity and democracy. Carefully written, this article is also long, long enough to be in two parts. The first part relates race, equality, opportunity and democracy to the role that Anthony W. Marx is serving with respect to these library real estate deals in his role as president of the New York Public Library. The second part focuses on the particularities emerging with respect to how race, equality, opportunity and democracy relate to the proposed sale of the first two libraries being put up for sale in Brooklyn, the Pacific Branch and the Brooklyn Heights Library. These are included as two parts of one long article because it is all connected and must be considered as a whole. 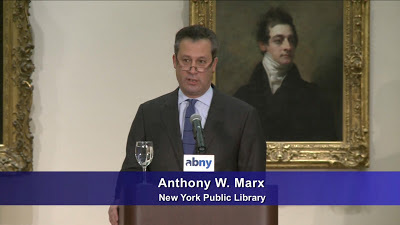 The most important thing that New York Public Library president Anthony W. Marx (known as “Tony”) said on February 1, 2013 in a speech (click for best viewing) to the Association For a Better New York was his remark as he introduced the subject of the controversial Central Library Plan, a consolidating shrinkage of Manhattan’s four main libraries (at about 17:00 in on the tape) about two-thirds of the way into his address. He brought up the Central Library Plan right after speaking at length about the importance of the public’s universal access to libraries. The city of new York has erected this building for the free use of ALL the people. The “ALL” in the above statement is Marx’s own emphasis, something we will return to. • his remark (at 9:00) that New Yorkers are coming to the libraries for “our air conditioning” . . . . Library officials have adopted a peculiarly routine habit that whenever they want to sell libraries they justify their plans by citing insurmountable problems with library air conditioning and conjuring up startlingly high costs for repair. What’s wrong with the consolidating shrinkage of the Central Library Plan, which is essentially a plan to create real estate deals for the likes of Mr. Rudin at the expense of the public which will be losing irretrievable assets? A lot. Who is Mr. Rudin to be asking "what’s the problem?" He is the real estate developer that was involved with the demise of Greenwich Village’s St. Vincent’s Hospital through a plan that similarly began as a partnership between private real estate developers and a supposedly charitable institution that optimistically spoke of benefitting the charitable institution. In the end, after great preoccupation on the part of the partnership decision makers with the real estate deal, the real estate deal was all that survived.. . . As noted above, Rudin concluded by telling Marx “We’re here to help you.”. . . When Marx chose to heavily emphasize the word “ALL” in the engraved statement, “The city of new York has erected this building for the free use of ALL the people ” and to use the heavy emphasis he put into that statement to introduce the topic of the Central Library Plan he was choosing to frame the plan's introduction in the context socio-economic diversity. The structure of his speech immediately prior thereto had included a substantial amount of rhetoric to establish that he favors accessibility of the system. Even if it is being somewhat subtly done, Marx was also implicitly making the dialogue about the subject of race. Marx has written extensively about race. “Race” is often in the titles of what he writes. In big politics this is often referred to as “playing the race card.” It is not as if the issue of race would not inevitably need to be discussed given what is going on, but it is interesting that the NYPL chose to preemptively raise the discussion before anyone else. The viewpoint Marx has chosen to promulgate, that despite the epigram carved into the mantel of the Trustees Room, the Central Reference Library erected by the City of New York in 1910 has somehow not been serving “ALL” the people for all these many years or somehow might have ceased to do so when the very small circulation library present there years ago was moved out of it has been challenged as a false narrative by a number of writers, including by Ada Louise Huxtable in her last column for the Wall Street Journal before she died, Michael Kimmelman as the New York Times architectural critic on that paper’s front page and before those two writers by Charles Petersen in an article that delved into what is really going on at the New York Public Library. The library's own releases, while short on details, consistently offer a rosy picture of a lively and popular "People's Palace.” But a research library is a timeless repository of treasures, not a popularity contest measured by head counts, the current arbiter of success. This is already the most democratic of institutions, free and open to all. Democracy and populism seem to have become hopelessly confused. The problem with it is not, as many prominent writers and scholars have complained, its excessive populism or the inconveniencing of researchers who might have to wait an extra day for books to arrive at 42nd Street from New Jersey. These snobbish-sounding objections have only fueled the library’s public relations offensive, which has advertised the plan as democratizing a building that many New Yorkers find intimidating. But the library, free and open, is already an exemplar of democracy at its healthiest and best, of society making its finest things available to all. Climbing the library steps, passing the lions, rising up to the reading room where anyone can ask for books, enshrines, architecturally, the pursuit of enlightenment. Inspiring more people to reach those heights is the library’s loftiest mission. Peddling “democracy” as if it were a popularity contest is what “American Idol” does. Of all the justifications for the renovation, none is more disingenuous and misleading than the claim that the library is simply trying to make the main building more “democratic.” This is a facility that has stood for over a century and provided unparalleled service to a public that no other institution gives a damn about. It is the most democratic research library in the world, far more welcoming to the average user than the Bibliothèque Nationale, the British Museum, or the Library of Congress, let alone the libraries at Harvard and Yale. . . .
. . . . While the administration at the New York Public Library likes to pretend the renovation will not affect researchers, when pressed they insist the main building must be “democratized.” The result is a bad dialectic between the casual readers, who like to check out books, and the fussy, over-educated “elite” readers, who want obscure volumes. . . .
All of the above authors are perfectly correct, but in focusing in so specifically on the fallacies of the NYPL’s “"People's Palace” PR, they all leave out a crucial aspect of the much bigger picture that the NYPL is choosing to side-step. The questions of race, equality and access are not exclusively about the 42nd Street library: Part of what is behind the Central Library Plan and helping to drive it is that all of New York City’s libraries are being deliberately underfunded to manufacture an excuse to sell off city libraries while contracting the size of the system in the process. There is no fine parsing the discriminatory effect of this: It is fundamentally undemocratic. The sale of libraries to create real estate deals is an unjustifiable plundering of the system for the benefit of the few at the expense of the many. Do such issues really simply vanish if Tony Marx pronounces that everything is exactly the opposite? Isn’t that exactly the idea of having him say so? Marx started as president of the NYPL July 1, 2011. 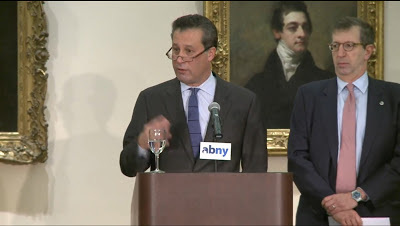 That he would be assuming that position was announced ahead of time, October 6, 2010, after a special meeting of the NYPL trustees, see: New York Public Library Names Dr. Anthony Marx Next President. 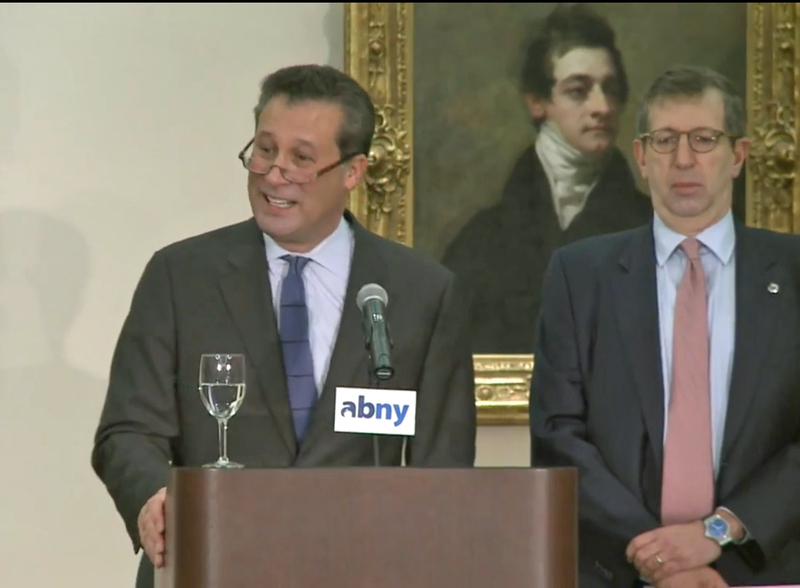 "At Amherst, and for higher education more broadly, Tony Marx has been a courageous and skilled leader. He understands instinctively that America's greatest institutions need to be more accessible to all Americans, based on merit rather than elitism based on wealth and connections," said Jide Zeitlin, Chairman of the Board of Trustees at Amherst College. He is the highly regarded author of more than a dozen scholarly articles and three books: Lessons of Struggle: South African Internal Opposition, 1960-1990 (Oxford University Press, 1992); Making Race and Nation: A Comparison of the United States, South Africa and Brazil (Cambridge University Press, 1998); and Faith in Nation: Exclusionary Origins of Nationalism (Oxford University Press, 2003). 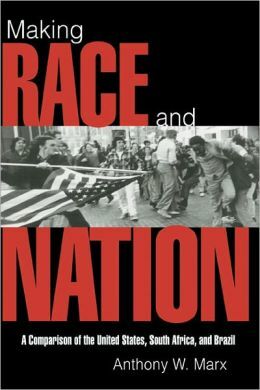 Making Race and Nation received the American Political Science Association’s 1999 Ralph J. Bunche Award for the best book on ethnic and cultural pluralism, and the American Sociological Association’s 2000 Barrington Moore Prize for comparative-historical sociology. He received a John Simon Guggenheim Fellowship in 1997, in addition to fellowships from the United States Institute of Peace, the National Humanities Center, the Howard Foundation, and the Harry Frank Guggenheim Foundation. There is still more in the press release that drives home the point that Marx’s strong suit is that he is undeniably credentialed as an individual with a track record and knowledgeable expertise when it comes to diversity and pluralism. Earlier I noted that it is interesting that the NYPL preemptively raised the issue of race and equality before anyone else. It is also interesting that when they were hiring a new president while adopting a course of selling off libraries and pushing forward the Central Library Plan it looks like the priority was to find someone with exactly this kind of résumé. When the protests against the project began, Marx found himself having to cope with an outpouring of resentment against a plan he had played no part in creating. His career before he took over the library would suggest that he might have been more inclined to give priority to strengthening the library’s neighborhood branches, many of which are starved for funds. But he inherited both the concept of the Central Library Plan and its architect, and it is unlikely that the trustees would have hired him had he balked at carrying out Foster’s plan. Some library insiders are saying that President Anthony W. Marx is a fairly nice, smart and level-headed fellow. Can you comment and provide a response from, or on behalf of, President Marx on their insight that President Marx, given his thinking on the subject, would not, himself, exercising his own judgment, have initiated or recommended the Central Library Plan* to the library’s board, but is in a position of now having to support it because he inherited the plan upon his arrival? Mr. Weine told me that he prefered that this not be first question I asked him to answer so, putting that question on hold for the time being, I proceeded to substitute the following question. NYPL On Whether Central Library Plan Is "Top Down"
"All large public projects get stronger as they receive feedback—which has certainly been the case for this plan, which will unite the nation’s busiest circulating library with its most treasured research library. Do you have a similar statement about public input with respect to the Donnell Library sale and closing back in 2008 or does NYPL make a distinction between its handling the Central Library plan and input from, and communication with, staff, the public, and elected officials representing the public’s interest and point of view vis a vis-à-vis the Donnell library? Mr. Weine’s absolute refusal to answer to this follow-up question is far more telling than the first answer he furnished to my earlier question about the top-down nature of the Central Library Plan because both the Donnell deal and the Central Library Plan are the product of the same team of people at NYPL. If you want to know what people are really about look at what they choose to do first and what they do in secret and that was the sale of Donnell for shrinkage announced suddenly in 2007. 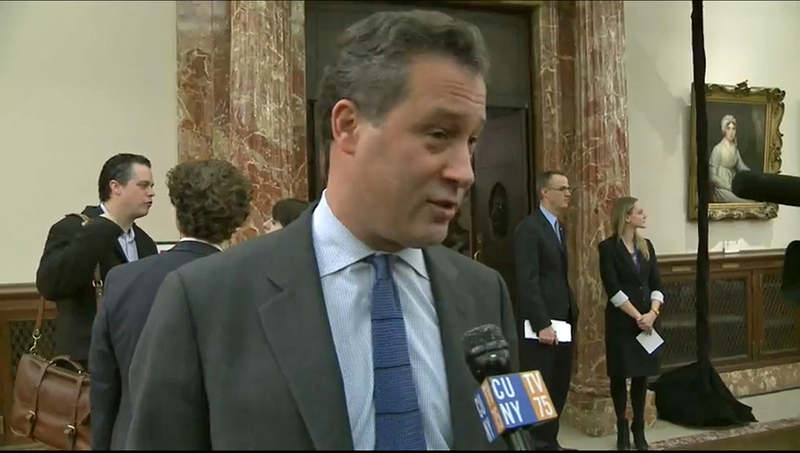 Others in the community of library administration officials are disavowing the Donnell transaction: Josh Nachowitz, spokesman for the Brooklyn Public Library, has said, “Donnell is great example of how not to do this [sell off a library]” and has been consistently highly critical of the Donnell transaction in public even as he essentially advocates replicating that transaction with the again top-down conceived and dictated, sell-off and shrinkage of the Brooklyn Heights library, like Donnell an important main library, this time in the borough of Brooklyn. Donnell is disavowed in another way. As you see from watching Marx’s ABNY address, Marx and NYPL library officials consistently refer to the consolidating shrinkage of the Central Library Plan as a consolidation of “three” of Manhattan’s main libraries, not four: the 42nd Street Central Reference Library, the Mid-Manhattan circulating library and the Science and Business Industry Library (SIBL) co-located and integrated with CUNY at 34th Street. The fourth library not mentioned as part of the consolidation is Donnell, because if library officials have to mention how the CLP deals with the scattered remnants of Donnell they would have much more for which they need to account. Yes, Donnell is officially disavowed but Marx not only inherited the Central Library Plan, he inherited the staff that produced the Donnell sale, including NYPL Chief Operating Officer David Offensend, and they are still in place. They are the ones behind the Central Library Plan. 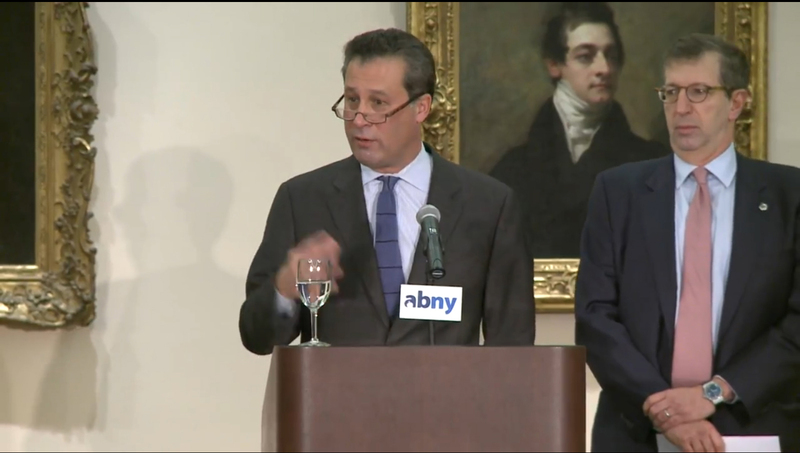 Stuck with Donnell, Marx made an interesting choice presenting plans for the “replacement” Donnell to the NYPL trustees on May 8, 2013. He apologized only for the delay in providing the "replacement" library blaming it on the unexpected financial crisis. He didn't apologize for the shrinkage (down to one-third size), nor for its being almost entirely underground, nor for the low net price for which Donnell was sold (selling a huge newly renovated five-story-plus library in mid-Manhatan for less than $39 million), nor for the fact that it doesn’t seem to look or function like a library and has few books (New York Magazine’s Justin Davidson tweeted that he wonders whether they would have “room for Orwell”). Closed in 2008, the inferior "replacement" for Donnell will not be completed until at least 2015. Mr. Weine’s statement is factually incorrect. The NYPL has not had one single documented “discussion” about the CLP with any architecture or preservation group over the past five years. In fact, opposing architecture and preservation groups had to scramble in haste to provide written testimony against plans revealed just a day or two in advance of votes taken at Community Board 5 and the Landmarks Preservation Commission. Furthermore, Mr. Weine’s recycled remarks from the library’s press office under-gird a fundamental flaw in the NYPL’s engagement with the public; what Community Board 5 and the Landmarks Commission approved were just the final details--the end result--of a radical, top-down plan dreamed up by the Trustees after extended, multi-year internal discussions. There was no public input, nor oversight of that process whatsoever. When the C.L.P. began to come back to life, it was almost as a stealth endeavor. The library didn’t have a final version of the architectural plans to show anyone—it still doesn’t—and despite the city’s commitment, the library didn’t have enough money to set a starting date. Clearly, Marx has signed on to support Central Library Plan espousing the highly questionable tenet that it is democratic. Why? Some say that when Marx took his position with NYPL he was eager to move back to New York. His compensation, though the precise number has not yet been made public, also probably provided a substantial attraction. Publicly available figures show that when Marx’s predecessor, Paul LeClerc, left office his all-in compensation annual compensation for 2011 (including some minimal deferred compensation) was $1,408,757. Marx clearly took his position knowing he was going to have to support the Central Library Plan and likely he had already conceptualized he could support it with a theme of “democratizing” that would have been consistent with the content of his CV. But did he really know at that time the full implication of what he was signing on to support? Even now, even in public hearings, it can be seen that specific details of running the library are fed to Marx by NYPL Chief Operating Officer David Offensend. A joke told about Marx is that November 6, 2011, the date of Anthony Marx’s arrest for drunk driving in a NYPL car, was the night that Bloomberg told him what he was going to have to do with respect to selling off the libraries. While Goldberger reports that the arrest was complicating factor in terms of Marx’s relationship with the NYPL trustees at a time when they were already complicated the joke, for reasons already mentioned, is probably unfair to the extent that it implies that Marx didn’t know he’d have to support the CLP. But maybe Marx, hadn’t until that time considered the full implications of supporting the CLP, what it meant in terms of taking library sales and shrinkage on the road across the city. The November 6th DWI incident was right around the time that a lot of ramping of the real estate deals selling off city libraries was occurring. October 16, 2011, Brooklyn Public Library President Linda Johnson, Marx’s BPL counterpart, was telling the Daily News the BPL was envisioning of certain real estate deals. Forget any possible jokes about it, there is a serious question about whether Marx when he took his job to support the CLP seriously considered the implications of plans to sell libraries across the city in a system shrinkage, and (as we'll get to in a moment) the way that the deliberate underfunding of libraries is being used as a rational for such sales and shrinkage. Meanwhile, Marx is fronting effectively for these things drawing on a deep well of credibility. As for the applicability of Marx’s work at Amherst to libraries: Marx was working to open access to an elite school and the education available there. He was not working to ensure equal access to Starbucks or to replace that elite education with something that would resemble simply schmoozing at Starbucks. BTW: My lefty friend thinks the personal foible of the drunk driving arrest should be dismissed as something that’s not that important. That's something I sort of agree with him on. And yes, as my friend points out, cell phone use while driving is also pretty dangerous. But what about the fact that, coincident with creation of these real estate deals and proposed system shrinkages, New York City libraries are being underfunded when usage and city wealth are up? Does Marx really buy into the rhetoric that because libraries are being underfunded they must now be sold off and shrunk because there is no way to fight the underfunding itself? Shouldn’t the strategy have been to mount an effective fight? Rather than tolerating underfunding year after year and then suddenly announcing that things are at the irreversible point of no return where libraries must be sold, wasn’t there a far more effective strategy that would have raised the necessary funds? Why didn't the library system do this: Announce that unless the diminishing funding for libraries from the Bloomberg administration were quickly and substantially increased libraries were going to have to be sold to rapacious developers and the system shrunk? Instead potential sales of libraries are kept under wraps and sprung on the public at the last minute. Like the initial sale of Donnell, these library sales have been secretly conceptualized at the top by library officials for many years. That information could have been pushed out to the public long ago. When information about the sales is finally made public library officials work to make the sales palatable by obfuscating about the shrinkage and other losses to the public. 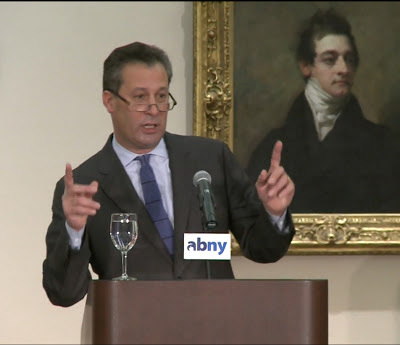 Signs that Marx is either complicit in the political theater favoring the sales and system shrinkage or sleepwalking through the issues can be seen in the brief Q&A session at the end of the ABNY breakfast. I just want to mention that, as regards to budget, obviously under Speaker Quinn’s leadership we’ve restored something in the neighborhood of $400 million to libraries over the last five years and I feel like that deserves a mention and some applause [which he then got!] . . . and it’s never enough we always want more for our public libraries. . .
Well, first let me reiterate as I said, the council, particularly Jimmy, you, and council member Gentile and Jackson who are here and so many of your colleagues have done amazing work. And as I said, you know, those restorations are lifeblood for us and we know how much you fight for them and we couldn’t be more grateful. We just. . We want to be able to do more. Not mentioned is that although City Council Speaker Quinn has herself “acknowledged the toll this annual Kabuki dance” takes on the library system, she has, as Van Brammer knows, year after year refused to introduce the baseline funding bill that would put an end to it. All this praise for “restorations” of funding obscures the fact that, in the bigger picture what is being praised is annual reductions of funding under Quinn’s leadership. Why does Van Brammer ask that Quinn be applauded for such “leadership”? Because you get more flies with honey? Or because Quinn is so powerful that the only way that Van Barmmer was going to mention the important economic benefits of libraries was to praise Quinn first? Why does Marx play along, saying that the City Council has done “amazing work” and that the library system “couldn’t be more grateful” for such reductions? Endorsing this perverse norm as something sensible the public ought to accept is tantamount to saying that libraries should be sold simply because wealthy New York doesn't fund its libraries even at the level that economically troubled city of Detroit funds its libraries. Once again, why didn’t somebody shove all this kabuki theater (aka “Dwarf Tossing”) aside and sound the alarm to the public that unless libraries got proper funding there was going to be a fire sale of public library real estate to rapacious developers? Surely then Quinn responding to the resulting public outcry and demand that libraries be properly, funded would have stopped blocking the baseline funding bill. Not having sounded the alarm is resulting in all New York City libraries being underfunded, decreasing opportunity and equality throughout the city. It is quite apparent that waiting until the last minute was calculated to better excuse the real estate sales. It’s something Anthony W. Marx ought to have given thought to. The New York Times recently ran a story about Majora Carter, a well known award-winning South Bronx activist who, among other things, was awarded a $500,000 MacArthur Foundation grant in 2005. See: Hero of the Bronx Is Now Accused of Betraying It, by Winnie Hu, April 4, 2013. Honestly not sure I see the problem. Carter contributed years of her life to improving her community; now she wants to make a decent living. Nothing wrong with that. It's not the same career but a lot of the people criticizing her have never made the contribution of time that she made. Yes, now that she's on FreshDirect's payroll she probably shouldn't be trusted on whether the company should get its permits. Knowing that there is no money in activism, essentially what I mostly do now myself, I give a fair amount of thought to these kinds of things. It seems that Anthony Marx inevitably must consider these things too. There are those who when they look at a building or a neighborhood to assess what kind of shape it is in will be less inclined to see the actual infrastructure they are looking at than the people who are filling that space. If the people in that space are of the same socio-economic strata as themselves, or above, they may be more inclined to conclude that the neighborhood or the buildings they are assessing are in good shape and quite serviceable to their purpose. But if the people inhabiting that environment have less wealth (or are of a different race) that conclusion might not be so quickly reached. The proposed sale of the Pacific Branch library involves such a complicated shell game it is difficult to get into it all (including the idea that the pubic was encouraged to approve- blackmailed?- of rezonings and additional density to get a new library near BAM.) The Pacific Branch, like the Brooklyn Heights branch, is also right next to Forest City Ratner property, just yards from the Ratner/Prokhorov “Barclays” arena. Suffice it to say for purposes of this discussion that, big picture, what the BPL is now proposing to do is to sell and close the Pacific Branch that serves an identifiable population and use the proceeds (they won’t be entirely sufficient) to pay for outfitting a new library across the Street from BAM. Par For The Course: A “Cultural Condominium”? At recent City Council budget hearings about the libraries, Linda Johnson, the BPL president apparently having not gotten the memo about not sounding elitist described the new library to go across from BAM as a “cultural condominium.” That, indeed, reflects back to the original idea for the library, an idea now theoretically abandoned, of the library being a sort of specialized arts-oriented extension of BAM. The new BAM “cultural condominium” library would be further away and physically removed from the constituency of the Pacific Branch, on the other side of three of Brooklyn’s major intersecting traffic ways. Richard Reyes-Gavilan, the Brooklyn Public Library's director and chief librarian, dismisses the distance as being a mere “golf shot” away from the old site. Reyes-Gavilan works on the libraries real estate deals and was promoted on October 18, 2011 (as the real estate projects were coming more to the fore) to help Linda Johnson “lead the transformation” of the libraries. It could be that Richard Reyes-Gavilan is correct and the quarter-mile distance the cultural condominium library would be set up would be just a “golf shot” away (or maybe the distance of several golf driving ranges), but, in other ways the new library would likely be a more significant move away from the current clientele of the Pacific Branch. Different Kinds of Gentrification- Does Anyone Get Left Behind? Gentrification is a difficult subject to discuss: Its dynamics are complicated and the word can describe a range of differing processes. When Jane Jacobs wrote her “The Death and Life of Great American Cities” in 1961 before the term “gentrification” was coined she described an organic process she called “unslumming” that might today be included under the “gentrification” rubric, but that process was not so much an economic eviction of people in a neighborhood but the growth into prosperity of the residents of a neighborhood through their own industry and self-improvement. At the other end of the spectrum is a process that often raises hackles is when, with shifts in economics, a wealthier population moves in to displace a lower-income population. It is a little talked about dirty little secret that city governors are biased toward wanting wealthier populations within their city limits and tend to act accordingly. Both processes I just described will generate a wealthier neighborhood population. Libraries can factor in, actually assisting, particularly in the former process. Even though a city may thirst for workers of all economic strata city governors are prone to investing in resources that primarily serve and attract those who are wealthier. The real estate industry’s concerns are different but not necessarily always out-of-sync with the inclinations of city governors. The real estate industry thrives on change and construction and benefits from churns that may not be beneficial to the rest of the population. So long as it makes money in the end, the real estate industry doesn’t particularly care to which segments of society it directs its attentions. Nevertheless, there is always an economic attraction to serving wealth and when schemes are abusive it is more likely that those abused will be those with the less power and wealth. Rather than expound further I recommend viewing and reflecting on the recent documentary film “My Brooklyn” by Kelly Anderson, which addresses the history of real estate development in Brooklyn. The Park Slope Civic Council, objecting to the proposal to sell the current building and moving the library resources to the new site now under development, unanimously passed a resolution urging the preservation of the Pacific Street branch. The discussions of the council that led to the adoption of the resolution on March 7 ruminated in part on the discriminatory aspects. Are the other plans library officials have for “redeveloping” different libraries likely to involve such discriminatory evictions? We are only just beginning to see plans for the first libraries proposed to be redeveloped so the only way to judge what may still be under wraps is to look at what they want to do first. The other planned sale in Brooklyn, being pushed even further and faster along than Pacific Street, is the sale and shrinkage of the Brooklyn Heights Library. A key publicly stated justification for shrinking the library is the eviction from it of the Business and Career Library portion of that library, an important library for job seekers. The bottom line, whatever justifications offered, the library would be substantially shrunk. It was a shock that seemed entirely counterintuitive when the Brooklyn Heights Association almost immediately acquiesced and condoned the proposed sale and shrinkage of the neighborhood library. Here is background to be considered. This winter I was canvassing for the Citizens Defending Libraries petition and campaign outside the Brooklyn Heights Library with my wife when Alexandra Bowie came by. At the time Ms. Bowie was the Brooklyn Heights Association board member in charge of the BHA committee charged with responding to the proposed sale and shrinkage. In a brief conversation Ms. Bowie addressed a remark to us that I have a hard time absorbing and figuring out. She said, “There is something we have to be very careful not to talk about“ and then observed that a lot of people who used the library were not from the neighborhood. Whether she said “a lot of people” or “most of the people,” I no longer remember exactly. She elaborated by explaining that many of the people using the library came from the projects that were nearby. My first reaction when people tell me that something should not be talked about is that it is probably exactly what does need to be talked about. What exactly Ms. Bowie meant baffled me. At the time I was turning a lot of possibilities over in my mind. Even though Ms. Bowie was stopping to talk with us then we had a future appointment set up to meet with her to talk about our Citizens Defending Libraries petition’s opposition to the sale and shrinkage and what we were recommending the position of the Brooklyn Height Association should be. Interpreting In the Context of Dates: Who Decided What When? When Ms. Bowie said what she said, it was after the Brooklyn Heights Association’s annual meeting (February 11, 2013 also after February 22nd) and we strongly suspected the BHA was inclined to go along with the plan no matter how convincing we could be; nevertheless we had some hope that there might be some sentiment against a sale. One possible interpretation of Ms. Bowie’s remark with which I struggled with was that there would be less support for preserving the library if people talked about who its users included. BTW: Neighbors from the nearby project do use the library and the library, convenient to lots of transportation, draws users from all over the borough and city. We had our scheduled meeting with Ms. Bowie the morning of March 14th. What we didn’t realize when we met with her was that later that same day the BHA would (with no fanfare) put up its position on the web saying the position had already been voted by the BHA board. In that light our meeting with Ms. Bowie was scheduled for a futilely late date. Days later, on March 19. 2013, it was announced that Ms. Bowie had been elected the President of the Brooklyn Heights Association. Everyone seems to agree with that fact that the BHA voted to take its position only after the Friends of the library group took its position. 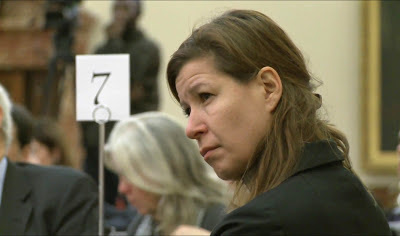 Judy Stanton, Executive Director of the BHA said the BHA adopted its position in support of the friends group position. The Friends group circulated its position for adoption by its trustees on February 20, 2013, the day before it was announced Ms. Bowie had become president of the BHA, a while before Ms. Bowie ran into us to make her remark about what should not be talked about. It is not clear that the Friends group ever adopted the odd position favoring the sale and shrinkage of the library. Instead the Friends group posted the position of its “steering committee,” a position apparently adopted preceding the February 20, 2013 circulation of that position to the trustees. 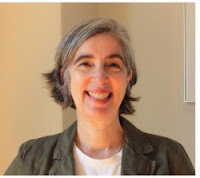 It was not previously clear who the Friends steering committee was but recently Deborah Hallan, the secretary of the Friends group, has provided information to fill in these details. The “steering committee” of the Friends group was composed almost entirely of outsiders who were not trustees of the friends group, whose interests were not necessarily aligned and may likely have been in conflict with those of the Friends group. One of these individuals was Alexandra Bowie. So the BHA may have taken its position in support of the Friends group position but, in turn, a steering committee that included Alexandra Bowie (about to be appointed BHA president), was meeting to lead the Friends group and give it its position. Ms. Hallen said the “steering committee” was set up to take over decision-making for the Friends group because BHA Executive Director Judy Stanton told her if she wanted to get any work done she should turn things over to a smaller committee. 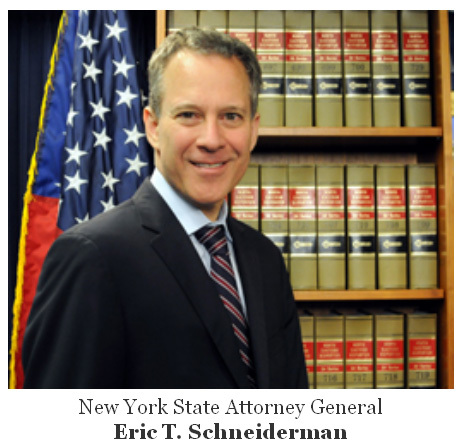 According to recent information from Ms. Hallen, the “steering committee” that took over this leadership consisted of Deborah Hallen, Alexandra Bowie, Roger Adler (a politically active lawyer), Tom Amon (a lawyer formerly on the BPL board last appointed by Bloomberg in 2008), and Dolores McCullough (a librarian working in the BPL main branch at Grand Army Plaza). The fleet `spontaneity’ with which both the BHA and the Friends group fell in line agreeing to abide the sale and shrinkage of the neighborhood is notable. The proposal was formally unveiled as of only January 29, 2013 by the BPL, which chose to do so at a Friends group meeting. The BHA already seemed firmly inclined to its position as of February 11th. The “Steering committee” that included Ms. Bowie made up its mind sometime on or before February 20th. At our March 14th meeting with her Ms. Bowie told us she had not known of the planned sale of the library until January. Similarly, Ms. Hallen very recently told us it was not until January that she knew of the planned sale and shrinkage. Whatever Ms. Bowie herself meant when commenting about people from the projects and from outside the neighborhood using the library, the fact to be considered is that shrinking the Brooklyn Heights Library, particularly the Career Library and making it into more of a Starbucks environment in a luxury high rise will effectively evict from the library some of the current clientele using the library.
. . . He is a LIAR if he looks people in their faces and says he enjoys that library. It is a horrific place. A new library that is smaller and in a mixed-use facility bringing housing to the area is perfectly fine. And, good housing stock will help that part of CPW be safer and become more alive. Let it go, already! It must be 99% of people in the Heights that would love to get rid of that nasty library. I would never bring my kids in there! SOme quality housing and a smaller, better library is what we need. It will be best for the community and the library system. The place is nasty. A new library would be fantastic. I used to take my kids there, but the children's room is overrun with lazy nannies ignoring their charges and completely disregarding the rules - diapers changed on tables, food everywhere. It's horrible. yo, that library is NASTY. it's not a regular neighborhood library - have you seen how filthy it is? what people do to/in that facility? no thanks, i'll buy and sell books on amazon. It is the WORST library I have ever been in. It is just amazing how city-run organizations are always hellish. Must Luxury Housing Be Library’s Presumed Replacement? If the existing Brooklyn Heights Library is sold and demolished the questions go beyond what will replace it in terms the size and adequacy of any replacement library and who such a library will serve. There is a question of what kind of building that replacement library will be in. This brings up the subject of deed restrictions to dictate what will be built on the city-owned land the library occupies. I found that the BHA was resistant to my suggestion that they recommend deed restrictions on behalf of the community. I discovered this in discussion following up after the annual BHA meeting, in our March 14th discussion with Ms. Bowie and when the BHA position came out later that March 14th day there was no request for deed restrictions. More recently, perhaps under pressure from our recommendation and cautions, Ms. Bowie on behalf of the BHA, has said that the BHA will negotiate for restrictions (not deed restrictions) on some of the aesthetics of the replacement building such as “finishes” and perhaps bulk. Here is something I did not bring up when I wrote recommendations to the BHA for deed restrictions in February but that I now realize I should have: Deed restrictions do not have to be confined to bulk, density or finishes. Deed restrictions could also address the future use of the property and could require that the city-owned land be used for affordable housing. A lot of people believe that affordable is desirable and some don't. Historical Precedent - Bringing Back What Was Lost? A specification that the land be used for affordable housing would be entirely appropriate and provide some historical continuity in several respects. The land is part of an overall parcel that was redeveloped as urban renewal property in the early 1960s. Other residential development in the urban renewal area was made subject to affordability restrictions when it was built. Going beyond the urban renewal that was actually carried out in the '60s, Robert Moses wanted to bulldoze much of Brooklyn Heights, nearly all of it, for roads, bridge footings and for more slum clearance urban renewal. In the end very little of the Heights succumbed to his plans after community opposition. The area of the Heights ultimately torn down in the urban renewal area did not actually look so very different than what surviving; it would now be nearly indistinguishable from the rest of the neighborhood had it survived. But if what was actually lost were the residences where the poorest Brooklyn Heights residents lived, as is so often the case when these decisions are made, then those who were the poorest were the ones making the sacrifices when residential units were subtracted from the neighborhood and subsidy was provided to keep white families in the neighborhood. If the Brooklyn Heights library is actually torn down then using the city-owned library land to provide lower-income housing would, in a sense, provide reparations to a segment of the population that sacrificed unequally in the urban renewal programs of the '50s and '60s. An argument that can be made against deed restricting the property to require low income housing if the library is demolished is that the land will sell to a developer at a higher price if the developer is allowed to instead build the luxury condominiums for which there would be more lucrative market demand. 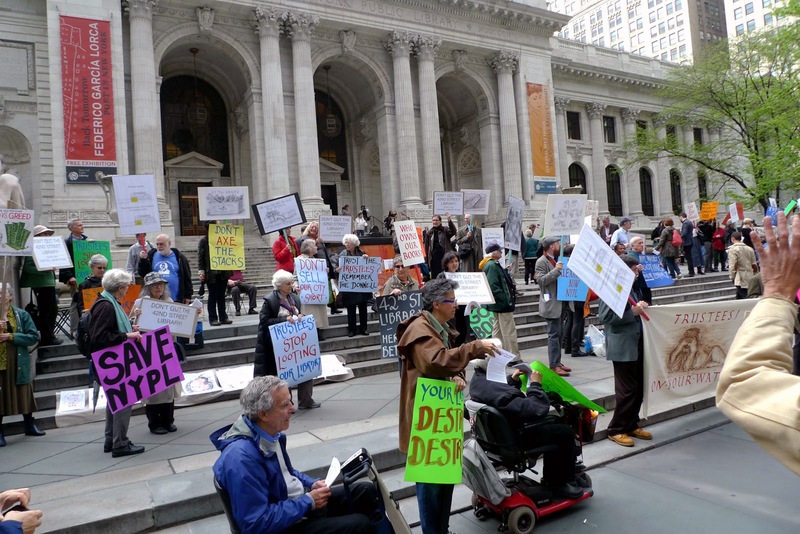 However, one thing to know when considering that argument is that any money from the sale of the library will go to the city of New York, not the BPL now fixated on selling its library. Further, there is absolutely no way to assure that the library would, in the end, get any more funds from the city after the sale. More important is that the BPL is intent on a sale structure, a “Request For Proposal” structure, involving a so-called “public/private partnership” that is not likely to bring in the best price for the library. I have written about this before. 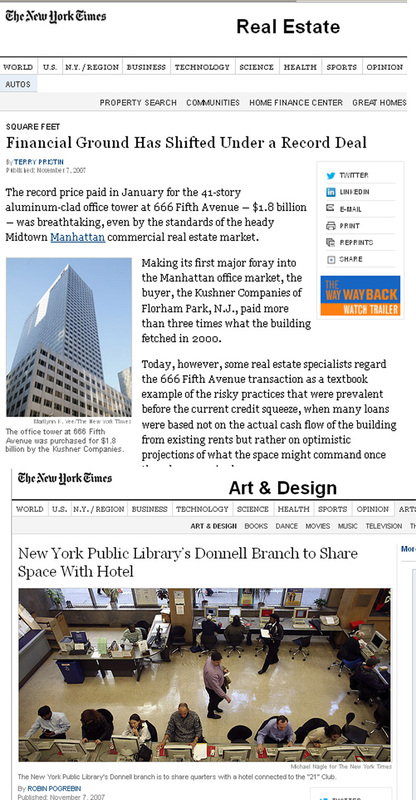 Indicative of how little concerned library officials can be about getting good value when an asset is sold is the example of Donnell, where a large five-story, newly renovated library in mid-Manhattan was sold by the library system netting only $39 million at the height of the 2007 real estate bubble. The penthouse apartment in the fifty-story building replacing it is now being marketed for $60 million. Had New York City and library officials truly wanted just to redevelop the Brooklyn Heights Library site and gett the highest price for it, instead of handing it off crony capitalism style to a developer, it could have served the public doing something entirely different and it would also have obviated any disruption of library service for the public: It could have built a new, larger library on other city property and then moved the library into it. This would have avoided any need for a multi-year "temporary" or "interim" library. Rending that appeared in Curbed of repurposing of space in Brooklyn Municipal Building where city is giving turning over 50,000 square feet of space to other use. For instance, there is a huge amount of space in Brooklyn’s Municipal Building across from Borough Hall and around the time the city was looking at redevelopment and future use of the library site just a few blocks away the city was deciding that a lot of the space in the Municipal Building should be changed over to another use. Those plans could have been adjusted to set aside the right amount of space for a large library. If that were done, it would be unnecessary for a generation of children to grow up without the support of a proper neighborhood library. There would have been no interruption of service as the new library would be completed before the old one vacated its premises. Afterward, the library site could have been put up for sale in a clean and simple Request For Bids process. But these approaches that would better serve the public are not what library and city officials are about. This is also not to advocate that tearing down and replacing the Brooklyn Heights Library is really the best decision to be made. The Future In Store? Northern Manhattan or Harlem? Will the future plans of library officials for other libraries be equally discriminatory in design and effect? The NYPL real estate plans calls for a “hub” library in "northern Manhattan" (does that mean “Harlem”?) and one on Staten Island and it speaks with Orwellian ominousness of providing “better service to users through fewer service points.” In the plans library officials have been rolling out new “hubs” mean consolidating shrinkage. Until the actual plans roll out for the rest of the library system one can only forecast on the basis of the plans library officials have already rolled out. Prospects are not good. The plans for the Pacific Branch and the Brooklyn Heights Library appear to be discriminatory in concept and design. The shrinkages of Donnell that puts a one-third size library underground does not seem so blatantly discriminatory but Donnell was one of the few places anyone could visit in midtown Manhattan and still feel comfortable without having substantial economic resources at their disposal. Let’s then return to how NYPL Tony Marx constantly strives to portray changes going on in the library system as democratizing. I don’t believe that he is even partially correct or believable in doing so, but even if he were there is a lot more going on that must be examined for its opposite and discriminatory effects. Yes, that is another effect. CUNY provides an education to New York students who cannot afford the costs of elite universities like Columbia or NYU. Those elite educational institutions have their own elite libraries out of reach to others. I said at the outset that this article had to be long enough to include everything it does because, in the end, it is all connected. We’ve covered a lot of ground here as a result. Perhaps it can be argued that some of the issues addressed here that concern equality, opportunity and democracy are more socioeconomic than related directly to the issues of race that so often closely interconnect. Arguably this is more a matter of the interests of the 1% taking precedence over the 99%. Nevertheless, the selling off and shrinkage of library system assets clearly diminishes opportunity. It is being done in a top-down, very undemocratic fashion for the benefit of a few at the expense of the many, and it will increase inequality in an increasingly unequal society. Despite protestations, it appears that it is being done by people who do not care enough about those ultimately losing out. . .
And it is unfortunate so many people are losing out. Crowd of some 200 or so demonstrating to save libraries May 8th, day of the NYPL Trustees Meeting. Demonstrators were on all three entrance sides of the building and some attended the meeting as well.